In the last two years, I’ve noticed a global shift on the federal and local level in respect to the issue of female genital cutting (also known as female genital mutilation and/or female circumcision). It’s being talked about more widely and publicly than ever before. Finally, female genital cutting of FGC is being acknowledged as a global problem. UNICEF reports that at least 200 million girls and women alive today living in 30 countries have undergone FGC. For the first time ever, in May 2016, the World Health Organization released guidelines addressing the management of health complications from female genital mutilation. The United States government announced a national initiative to fund female genital cutting community-centered health care and prevention projects. Here in Massachusetts, where I currently live, legislation was introduced to criminalize FGC this past year (there is no such in existence at this point). And I feel humbled at being able to witness this change. I’ve known about FGC for most of my life because it is a practice that is done within the Dawoodi Bohra community, a South Asian community, in which I was raised. And though I was born in the United States, at the age of seven, when I was on summer holidays with my family in Mumbai, it was done to me. Since this shift, more voices have come out in the open to speak out against FGC globally, and more organizations are collaborating with one another to spread awareness of this form of gender violence and to uplift the voices of survivors who are telling their own stories to the public in hopes that they can prevent future generations of girls from undergoing it, as well as to show that there is a need for support services for those women have unfortunately had to suffer through having FGC done to them. One such initiative is to join a storytelling campaign organized by Sahiyo and Breakthrough. 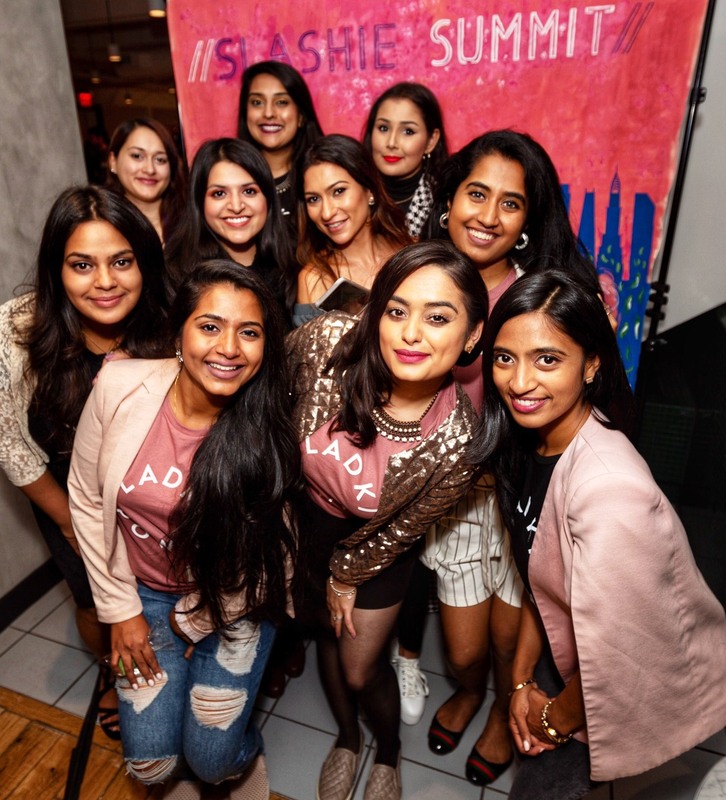 Sahiyo, of which I am a co-founder along with Aarefa Johari, Insia Dariwala, Priya Goswami, and Shaheeda Tavawala, is an organization dedicated to empowering Dawoodi Bohra and other Asian communities to end female genital cutting. Breakthrough is a global human rights organization that works to make violence against women and girls culturally unacceptable. The two have teamed up to show the connections between FGC and other forms of gender-based violence by exposing how rigid gender norms and ideas around female sexuality, and consent, amongst others, support and enable a culture where violence is normalized. Stories from survivors of FGC and their allies went live on Breakthrough’s digital storytelling platform, THE G WORD: Transforming gender norms, one story at a time in early June. 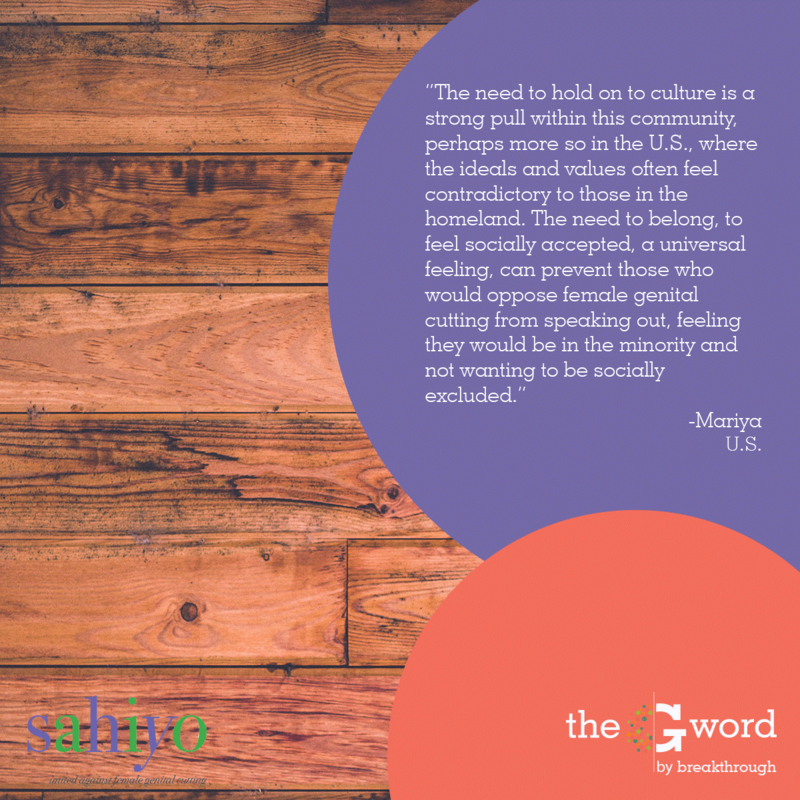 THE G WORD aimed to illuminate and transform rigid gender norms by harnessing the power of personal stories like those that Sahiyo has collected. The campaign ran from June 2nd to June 9th in which both organizations shared stories, graphics, and more information around FGC, as well as encouraged their followers to join in by going to Breakthrough and Sahiyo Facebook pages and sharing these stories with their own networks. To learn more about the campaign, you can e-mail Sahiyo at [email protected]. If you or someone you know has a story share it on Breakthrough’s storytelling platform, THE G WORD. Mariya Taher is currently pursuing an MFA in Creative Writing at Lesley University, MA. She received her Masters in Social Work from San Francisco State University and her BA from the University of California Santa Barbara, where she majored in Religious Studies and double minored in Global, Peace, and Security & Sociocultural Linguistics. Prior to attending Lesley University, she worked in the gender violence field for seven years. She has contributed articles to Solstice Literary Magazine, Global Voices, The Express Tribune, The San Francisco Examiner, BayWoof, and the Imagining Equality Project put together by the Global Fund for Women and the International Museum of Women. Next articleHyphen Podcast: How do People Choose to Practice their Religion? For nearly a decade, Mariya Taher has worked in the anti-gender violence field in the areas of research, policy, program development, teaching, and direct service. 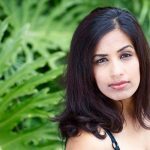 In 2015, she cofounded Sahiyo to empower Asian communities to end female genital cutting (FGC), and in 2017, was named 1 of 6 experts to watch on FGC by NewsDeeply.com. In 2017, she joined the Topos Partnership, an organization that seeks to change the landscape of public understanding where public interest issues play out. The Manhattan Young Democrats named her a 2017 Engendering Progress honoree and ABC news did a special feature on her, entitled: Underground: American Woman Underwent Female Genital Mutilation Comes Forward. Mariya is a prolific writer in fiction and nonfiction with essays and short stories appearing on NPR, Ms. Magazine, Huffington Post, Solstice Literary Magazine, The Express Tribune, The San Francisco Examiner, The Flexible Persona, Cecile’s Writers’ Magazine, and more. Follow her on Twitter @mariyataher83. Nouman Ali Khan: What in Male Privilege Allows Gender-Based Violence to Occur?